Though tragically snuffed out by the rise of fascism, Red Vienna was an island of socialist organizing and workers' power worth commemorating. When it comes to progressive urban planning and municipal administration, “Red Vienna” (1919–1934) remains a common reference point. Best known for its housing programs, this radical municipal project also entailed comprehensive social improvements that included health care, education, child care, and cultural reform efforts. Red Vienna represents a historically specific, social-democratic response to social and political questions that remain relevant today: the distribution of wealth, access to infrastructure, and the reorganization of reproductive labor. Against the backdrop of contemporary challenges to left, urban politics — the struggle for the right to housing, for public reinvestment, and against the rising right — we should look back on this sweeping interwar project to draw out the possibilities and limits of progressive urban politics within a conservative state. Other European cities also approved socially oriented, modernist housing projects for their urban working classes: both Frankfurt am Main (“New Frankfurt”) and Zürich (“Red Zürich”) initiated programs much like Vienna’s in the wake of World War I, but none were nearly as expansive and ambitious. Socialists also organized outside of parliament through its military wing, the Schutzbund, and through the labor movement. In Vienna, the Social Democrats regularly won an absolute majority in city council elections, revealing that both the city’s working class and large segments of the emerging white-collar professional class all gravitated toward the party. Red Vienna became a massive force in national politics. But the challenges of running a socialist city within a conservative state soon became evident. The city administration pursued a political project that ran counter to the federal government’s aims and, to some extent, even contrasted with the behavior of the more reformist wing in the Social Democratic Party. Beginning in the 1920s, the balance of forces began to shift against the labor and women’s movements’ interests. Calls to eliminate the “revolutionary rubbish” grew increasingly loud in public debates. Following the collapse the first governing coalition in 1920, the SDAPÖ would never again participate in a First Republic national government. Meanwhile, as in Germany, inflation triggered by the war spread across the country. The currency’s collapse only stopped after the League of Nations promised to guarantee foreign credits. The government planned to balance the national budget by raising revenue and cutting expenditures, a familiar formula that was, as always, conducted at the expense of the vast majority. In Vienna, the SDAPÖ concentrated on municipal political projects. A thorough restructuring in all spheres of life, they thought, would produce the “new man” prepared for the coming socialist society. The approach’s ideological foundation came out of Austro-Marxism, an ideology located somewhere between reform and revolution that sought to realize socialism through the ballot box. The corresponding political strategy emphasized building hegemony within the confines of the city. Vienna’s municipal administration intervened in the postwar economic crisis with a massive investment and infrastructure program. Unsurprisingly, it immediately faced a barrage of criticism from bourgeois and right-wing forces. Opposition to Red Vienna’s policies united the federal government, the main industrial and banking associations, big capital, the church, and the fascist and paramilitary organizations against the city. Despite internal and external resistance, the city council used a broad, tax-based wealth redistribution program to pay for the programs. This was only possible after 1922, when Vienna became a federal state and thus acquired far-reaching autonomy on tax policy. The Breitner tax, named after the councilor of finances, raised money from luxury goods and consumption, taxing cars, horse racing, and domestic servants. A progressive housing tax, which largely targeted villas and private homes while ignoring most working-class apartments, also supported the project. The council created a broad economic stimulus program, including massive investments in infrastructure and job creation, while a wave of municipalization and nationalization swept the reproductive sector. The administration focused on spheres we would today describe as “care work” — nursing, medical care, education, and so on — and equipped them with improved infrastructure and significantly increased resources. A massive expansion of child care and youth centers, modern nursing homes, and general health-care improvements followed. The administration pushed pedagogical reforms and increased opportunities for continuing education. Countless new libraries opened, often inside the public housing projects shooting up across the city. A broad network of publicly subsidized cultural associations and clubs gave more citizens access to cultural education. Together, these projects represented a comprehensive program of education reform and modernization. At the same time, new bridges, streets, parks, and promenades pushed forward the city’s architectural reorganization. In the nineteenth century, Vienna, as capital of the Austro-Hungarian Empire and residence of the Habsburg monarchy, grew into a metropolis of over two million inhabitants. In 1910, it ranked as the fifth-largest city in the world, after London, New York, Paris, and Chicago. Migrant labor from different parts of the empire allowed the city’s industrial center to expand. Much of the population lived in aging over-crowded apartment buildings without proper lighting and ventilation. Multiple generations crammed themselves into overpriced tenement blocks in the city’s proletarian suburbs. Rents skyrocketed, and many lodgers only leased a bed between shifts at the factories. Tuberculosis as well as rickets — typical illnesses of the Viennese working classes — spread through the poorer districts. The dire housing crisis following the war prompted the government to organize emergency housing, sometimes by expropriating vacant buildings. It opposed real estate speculation and successively bought up more and more property, so that by 1924 the Viennese government was the single largest property owner in the city. Between 1923 and 1934, it built over sixty thousand new apartments, which also served as job creators. Further, the administration supported the settlement movement, in which homeless war veterans and other destitute individuals seized unused land and built houses on it. Apartment complexes became the favored construction style, provoking the ire of the elites, who condemned the amount of money being spent on “red fortresses” — a label that points to the suspicion that they might someday serve military functions. When construction began on the Karl-Marx-Hof, a massive housing complex of roughly 1,400 units, many critics claimed it was structurally unsound. When the famous Amalienbad (a public natatorium in a working- class district) opened, the bourgeois press worried that proletarian visitors would steal its beautiful decorations. These housing complexes were usually multistory apartment blocks with green inner courtyards that provided residents with natural light and strengthened community ties and solidarity. The city connected these blocks to local infrastructure — like consumer cooperatives and schools — making residents’ daily lives easier by cutting down travel and shopping time. The apartments themselves were generally about 125 and 150 square feet and consisted of an open-plan kitchen, one room, and sometimes an additional closet. All had running water and toilets. Architects integrated the feminist and labor movements’ demands into the building’s layouts, and discussions around rationalizing and centralizing the domestic economy appeared in how the construction of the kitchens, child-care facilities, laundry rooms, and the Einküchenhaus — a series of apartment units served by one central kitchen. Planners intended that the state would take over traditionally female reproductive tasks and relieve women workers, already stressed by the triple burden of wage labor, housekeeping, and raising children. Neither the complexes nor the various companies and services established to support them were intended to make a profit. The city administration continued to run public services like gas, water, power plants, and public transportation and pushed to take over private industries including garbage disposal and the canals. Rents were calculated to cover these operating costs and nothing more; in 1926, they averaged about 4 percent of a worker’s monthly wage. Apartment allocation was conducted according to a points system; alongside need, current housing situation, employment status, and war injuries, the city privileged applicants born in Vienna, which counted for four times as many points as Austrian citizenship. This demonstrates the city’s commitment to helping anyone who lived in the city remain there. Nevertheless, beginning with the outbreak of the global economic crisis in 1929, Red Vienna came under increasing pressure, both economically and politically. The First Austrian Republic responded to economic crisis by pursuing a policy of austerity. Saving the state from the crisis required them to take out loans from the League of Nations, which came, of course, with strict conditions. League of Nations financial representatives travelled to Austria and developed a “restructuring program,” which called for dismantling social infrastructure, cutting jobs, and slashing workers’ rights. These policies were generally enforced via emergency decrees to avoid parliament and democratic decision-making more generally. The crisis! Business people demand tax breaks, factory owners call for eliminating “social burdens.” . . . But is not the crisis felt . . . first and foremost by those about whom no one speaks — by the workers, employees, and civil servants? Now more than ever! Because it is their wages they want to cut, their welfare costs, it is they who are to pay more taxes, so that direct taxation can be done away with . . . In times of crisis, everyone is supposedly protected, only working people, and particularly women and the youth, are still forced to pay. The government and League of Nations financial committee made no secret of the fact that they viewed democracy as disruptive and likely to endanger the program’s success. So they established more authoritarian structures, justifying them by citing the country’s dire economic need. The SDAPÖ criticized the austerity policies but nevertheless tolerated them at the federal level, at least in some instances. Red Vienna’s destruction closely resembles the authoritarian neoliberal measures that have been implemented in the wake of the most recent crisis. At the same time, it highlights the limited power municipal governments have when confronted with externally imposed debt ceilings. The Communist Party — not represented in parliament nor on the city council — had followed the Red Vienna project critically since its inception and protested these cutbacks, accusing the “Red City Council” of relieving the “ailing” economy at the expense of the “ailing working class.” On the federal level, the SDAPÖ proposed job creation programs and investments, as well as wealth redistribution through taxation, but their suggestions were ignored. In February 1934, the Austrofascist government removed Vienna’s administration in the course of its military evisceration of the labor movement as a whole, and appointed commissioners to rule the city. One of the caretaker government’s first measures dismantled the progressive tax system. Redistribution of wealth from the top to the bottom reversed, public housing projects were largely abandoned, rents rose, and social insurance and infrastructure were dismantled. Reconsidering Red Vienna allows the contemporary left to build on these experiences and strategies. Although today’s left has a vastly different character and exists in a very different political constellation, urban struggles continue. Anti-eviction movements (which include public-housing residents) and demands to productively use vacant space for new arrivals like refugees are mobilizing the Left across Europe. Red Vienna shows that far-reaching and transformational ideas can be made into reality, albeit in a specific situation in which massive pressure from below pushed through reforms. Although today’s Vienna feels the effects of gentrification and rising rents, the city maintains a relatively high public housing budget when compared to metropoles of similar size. Vital to the interwar reform project was a political force supported by large segments of the subaltern classes that opened up a space for further changes and transformations. At the same time, Red Vienna reminds us how important it is to address state power on local, national, and multiregional levels. While tax autonomy provided Red Vienna with greater room to maneuver, the city’s progressive government could not defeat the combined forces of the national government and the League of Nations. We should take those lessons to heart, even while celebrating and defending the real achievements of socialist governance in Vienna. Veronika Duma is a historian and research fellow in the Department of History at the University of Vienna. Hanna Lichtenberger is a political scientist and historian in the Department of Political Science at the University of Vienna. 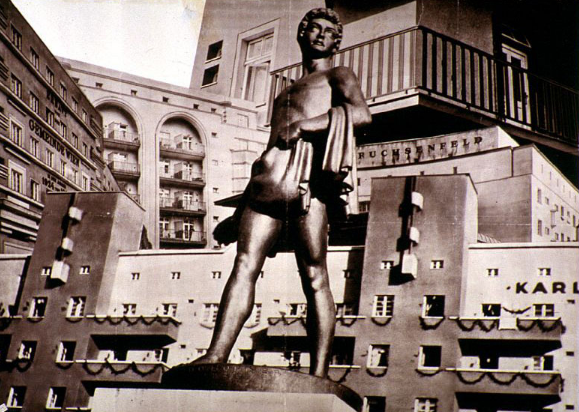 Though tragically snuffed out by the rise of fascism, Red Vienna was an island of socialist organizing and workers’ power worth commemorating.